CAIRO - An Egyptian court jailed more than 160 Muslim Brotherhood supporters for up to 15 years in prison on Sunday, pressing a crackdown on the Islamist group before a presidential election former army chief Abdel Fattah al-Sisi is expected to win. Defendants chanted "Down with military rule" as Judge Hassan Fareed handed down 10-year jail terms to 126 Brotherhood supporters accused of violence and membership of a terrorist group in one of the cases. A further 37 people received 15-year sentences in a second case related to an alleged attempt to blow up a Cairo metro station. The security forces have detained thousands of Brotherhood supporters since the military deposed president Mohamed Mursi last July following mass protests against his rule. Sisi, expected to easily win the May 26-27 vote, has signaled there will be no reconciliation with the Brotherhood. 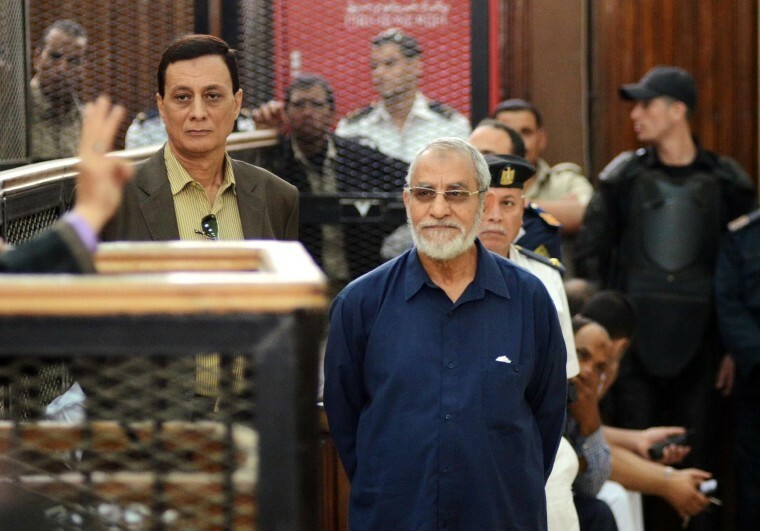 Brotherhood leader Mohamed Badie, who was among 683 people sentenced to death last month, made a rare address in court, rejecting the accusations leveled against his group. "We have never responded to any attack against us with violence," said Badie, addressing the judge in footage uploaded to Youtube. The judiciary was being used in a political conflict the likes of which Egypt had never seen before, he said. The government declared the Brotherhood a terrorist group after an upsurge in attacks on the police and army following Mursi's removal from power. Many of the attacks have been claimed by radical Islamist groups such as Ansar Bayt al-Maqdis. Mursi is one of many Brotherhood leaders now standing trial. He faces charges including conspiring with the Palestinian group Hamas against Egypt. Badie described that charge as "lies and falsehood."